This month I didn’t realize how much reading that I accomplished until now. Mostly I used the app from the library and read on my phone or I listened to audiobooks through the same app while we walked. 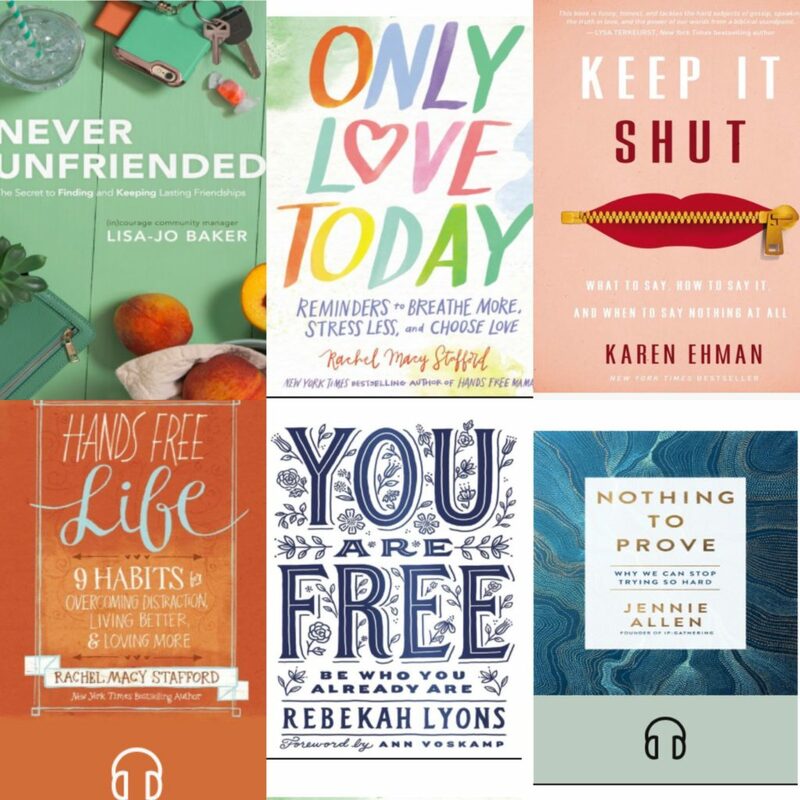 Never Unfriended by Lisa-Jo Baker // The perfect book for every woman. Especially if you’re feeling lonely in motherhood or life. It was nice to see a lot of other women feel the same and it’s a great read to put you into a better Christ-centered perspective. Nothing to Prove by Jennie Allen // Jennie is awesome! We’re doing Proven for our moms group at church and this is just another book women should read. Wonderful! You Are Free by Rebekah Lyons // Loved! Rebekah is really great! Only Love Today by Rachel Macy Stafford // Moms….read it. Read it. Read it. And her other books too. Easy reads that are really convicting. Messy Beautiful Friendships by Christine Hoover // Not completely done with this but I’m really enjoying it. Keep It Shut by Karen Ehman // I chose this book because the title and cover. No lie. But I ended up really enjoying her view and message. I mean, “what to say, how to say it, and when to say nothing at all” that’s a good lesson for anyone, but more recently it’s been brought to my attention that this is a lesson that I need to learn. So I’m learning. Work in progress. Gospel-Centered Mom by Brooke McGlothlin // I first read Brooke’s work when I read Praying for Boys. I’ve loved both of those books and would recommend them to any mom! After I look at the titles from this month I see a theme. Friendships and motherhood. But reminders that my worth isn’t found in those things. Which fits amazingly with the encouraging words that I wrote at the beginning of the month in my Powersheets…. “You may be rejected by man, but you are CHOSEN by your maker.” I love when things come full circle. God is so good. Thanks for sharing! I love reading and am always looking for the next book. I love your book choices. A few of these definitely look like books I’d like to check out. And I too sometimes pick a book based on the cover. Sometimes you find the best books that way. Thank you for these! I’ve been looking for more books to add to my reading list!